In just three weeks, the largest-ever roster of designers and celebrities will come together for Housing Works’ spectacular interior design shopping benefit, Design on a Dime, at the Metropolitan Pavilion in Chelsea. 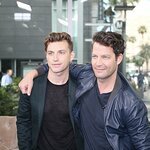 All five of this year’s co-chairs, Iman, Nate Berkus, James Huniford, Charlotte Moss, and Lara Spencer, will attend to raise funds for Housing Works. Housing Works is a non-profit with a mission to end AIDS and homelessness. Design on a Dime on May 5 features 54 of the world’s top interior designers. Each designer will create a room vignette using new, donated merchandise, which is then sold for 50 to 70 percent off retail pricing. Event sponsors include HomeGoods, Valspar Paint and returning media sponsor Traditional Home. HSBC Private Bank will present an Open House preview hour on opening night from 6 PM to 7 PM (Tickets start at $500). Design on a Dime 2011 benefits Housing Works’ Jefferson Avenue Residence Project, a new housing development consisting of 12 permanent units of supportive housing for single, formerly homeless adults living with HIV/AIDS. Tickets and information can be found here.